The most neglected areas on the roof, and the most prone to leak..
New age contractors and "Big Shop" middlemen sales operations offer the same sub-par details that don't last. When you hear the touting of "Ice and Water" underlayment or membrane as an answer to any roof leak, just say "No thanks." (Forgive these guys for they do not know any better, but do not use them to install a roof on your home!) Ice and Water underlayments have become a religion and proper flashing details have been neglected. Many of these companies are using modern methods that do not last. We have dubbed this trend "The Underlayment Craze," and a simple search on the internet can yield a lot of information on these issues. Bad specifications for flashings go hand-in-hand with bad roofing field installation practices (like low sloped shingle installation) and all of this can cause leaks, the onset of unhealthy mold and rot. The same chimney depicted above was never flashed properly and was leaking prior to the new Chimney Flashing work. See before photos below. 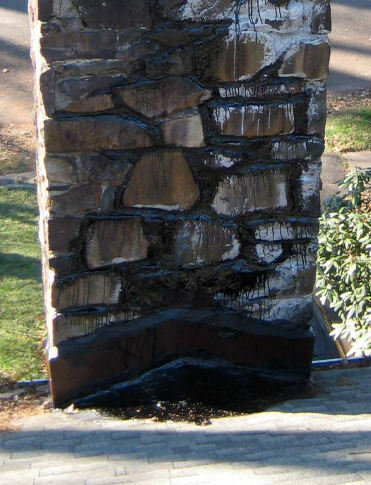 Click on the image on the left to view job photo page of this large stone chimney flashing. Note: We have many photographs of our Chimney Flashing work, but the one to the left depicts a common Chimney Flashing and exemplifies the real difference a Professional Chimney Flashing can make. In the residential and commercial roofing marketplaces, the vertical interruptions that are the most troublesome are those of the chimney flashing details. These areas are the number one service call request in the industry. They are usually addressed with asphalt cement or caulk by the novices in the trade and they usually leak in the first 1 to 5 years of service. By the time a leak is discovered on the interior of the structure, major damage may have occurred, and the contractor is more than often, out of the business. We get many calls related to inadequate chimney flashings. Word to the wise: It costs less to do it right, even if it costs a little more…. 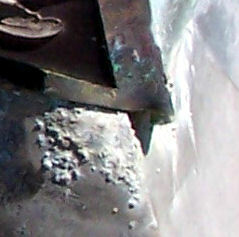 Above: Before image of horrid repair work by amateurs, N. Plainfield, NJ. Also beware of using Copper Flashings and Gutters that will be exposed to Cedar Run-off. 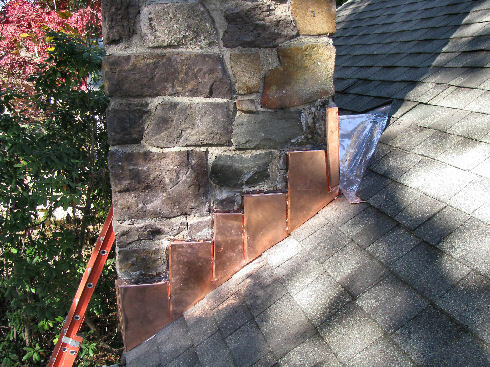 Unlike Aluminum, Copper is a formidable metal that resists the salts contained in Masonry and in Coastal exposures. 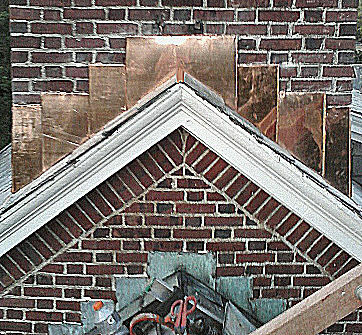 Copper Flashing should be isolated from harmful Tannic Acids of Wood Substrates. Leaks are caused by poor Chimney Flashings and leaks provide liquid moisture for mold growth. Attic mold under your roof is a serious problem that should be addressed by a mold remediation expert.